If you’re familiar with pay-per-click (PPC) Advertising, it’s likely that you know that Google undoubtedly occupies the clear majority of the search market, but does that mean you should nest everything in the one basket and forget about Bing’s advertising platform? Believe it or not, both platforms work best together. Of course, the underpinning goal for every business is to know how to harness the power of both platforms in order to achieve your specific business objectives. So, to help you get an understanding of whether you should contemplate one versus the other let’s look at why you should reframe your thinking towards Google plus Bing and what that truly means for your business. So firstly, what’s the objective of both platforms? Well in a nutshell, both are PPC advertising platforms intended to help businesses reach their target audiences, drive meaningful traffic to their website or landing pages and overall, increase their conversions and revenue. Whilst both platforms have been set up to achieve the same objective, each have their own set of unique features and benefits which is why it’s important to understand your business objective. The Search Network where advertisers create text ads to appear on the search engine results page (SERPs). See the example below. The Display Network lets advertisers create display ads (that can be in the form of images, GIFs or videos) that appear across a variety of websites across the internet. Bing is actually owned by Microsoft and has three search engines – Bing, Yahoo and AOL. This means that when you advertise on Bing, your ad is seen on all three which expands your reach to a larger set of audiences. This also means that you may also expect to see higher click-through rates. But let’s take a look at some of the key factors that have the biggest impact on your Business advertising. What Will Your Prospective Searchers See? As you’ll note from each of the below examples, both platforms showcase your URL directly beneath the headline of your ad. One of the more notable differences is that Bing makes your URL standout by using bold formatting. Both Google Ads and Bing also allow you to utilise 80 characters to describe your service or product offering. Can Bing Help Me Discover What My Potential Customers Are Searching For? Both Bing and Google Ads have a keyword research tool that allows you to search for the terms that your market is searching for. This tool lets you utilise negative keyword targeting as well. That means you can tell both platforms what sort of search terms you don’t want to appear for so that you are directing ONLY relevant traffic to your website or landing pages. Are My Ads Being Seen? Around 34% of desktop searches worldwide are carried out on the Bing network. The Bing network receives a total of 5.4 billion monthly searches with 136 million unique searchers. One of the most prominent stats shows that Bing Ads are reaching 63 million searchers. In addition to that, these searchers aren’t reached by Google Ads at all. If you’re surprised by the above numbers, remember that Bing is owned by Microsoft. This means that it’s the default search engine installed on all new Microsoft laptops and PCs (which is nearly 90% of all computers). It’s also the default search engine for the Internet Explorer browser. Take into consideration that a lot of people, particularly the older generation, don’t know how to change their search engine (or are deliberately choosing Bing as their default due to specific features and offerings), and you can see how Bing can have a larger market share than one might have first thought. However, whilst reach is important, it’s even more important to consider who exactly is seeing your ads. Are My Ads Being Seen By The ‘Right’ People? Let’s take a step back and look at the ‘type’ of person that would use the Bing network over Google. In addition to Bing’s increasing visibility, it’s worthwhile to note that the Yahoo and MSN search engines offer financial reporting which results in better click through rates (CTR) for financial and shopping based services, but it also suggests that you’re reaching a much more sophisticated audience. Recent stats are indicating that nearly three-quarters of Bing users are over the age of 35 and around one-third have a household income over $100,000. Whilst you may not necessarily run a business specifically in the financial service industry, it goes to show that Bing has a specific demographic of customers than align with your ideal prospect and help you produce even better results in conjunction with Google Ads. Do you know who they are and where they might search for your niche service or product? Are you using these advertising channels effectively to target customers that have the highest potential of buying from you? Most small to medium sized businesses see Bing Ads as an afterthought or give it no thought at all. Ironically this works in Bing’s favour as it minimises competition giving your Bing ads a better position and more visibility, which allows you to drive traffic to your website much easier and at a much lower cost-per-click (CPC). Some industries are experiencing as much as an average of 35.5% cheaper CPC’s on Bing compared to Google. To put that in a better perspective for you, you’re actually paying less to have a sophisticated prospect click on your ad to find out more about how you can help with their problem. According to Report Garden, the average CPC for a Bing Ad is around $7.99 compared to Google Ads at $20.08. Of course, many of this can vary from industry to industry but it certainly makes you consider the importance of using Bing Ads in addition to Google Ads. Lower competition generally translates to less money spent on your advertising and a lower CPC which means that you end up paying less for your traffic, leads and sales. A better ROI. This becomes particularly more significant if you’re operating in a market that has plenty of demand because there’s simply less advertisers using the Bing Network. In some industries, what you pay for traffic, leads and sales can be as much as 50% less in Bing than what you would pay in Google Ads. The Search Engine People recently found that Bing users were converting between 10% – 56% higher than Google Ads within the automotive industry. This suggests that Bing users are more engaged and actively searching to buy. Again, it’s not just a matter of looking at one platform versus the other. Google Ads certainly helps us reach a higher volume but when coupled with Bing, you have the potential to get even more traction and target a more granular (and possibly even a better qualified) prospect/customer at a much lower cost. What Else Can Bing Ads Do? Apart from being a great platform to leverage in order to get in front of a much more sophisticated audience that has a high chance of engaging with you and converting, Bing has many features in the background that can help you achieve these results. Increased granular targeting at an Ad Group level – Google Ads will let you target at the campaign level which means your ad groups remain limited to their campaign level targeting settings. In other words, Bing lets you can get more specific with who you show specific ads to as opposed to simply showing all of your ads to one target audience set at the campaign level. Simple set up – All you need to do is create a Bing account and once this is done, Bing offers you an easy import option from Google Ads. This means you don’t have to double-handle and recreate campaigns that you’re successfully running on Google. Bing has intelligent reporting tools – this will help you understand how your search ads and keywords are performing. Bing Ads let you control your demographic targeting – This is such an innovative feature whereby you can control the gender and age demographics of who sees your Bing Search Ads. This is particularly useful if you know that your product or service is purchased by a particular gender or age group. A feature that the Google Search Network doesn’t offer. Bing is proving to be a great sidekick to Google and supporting your PPC Advertising strategy. 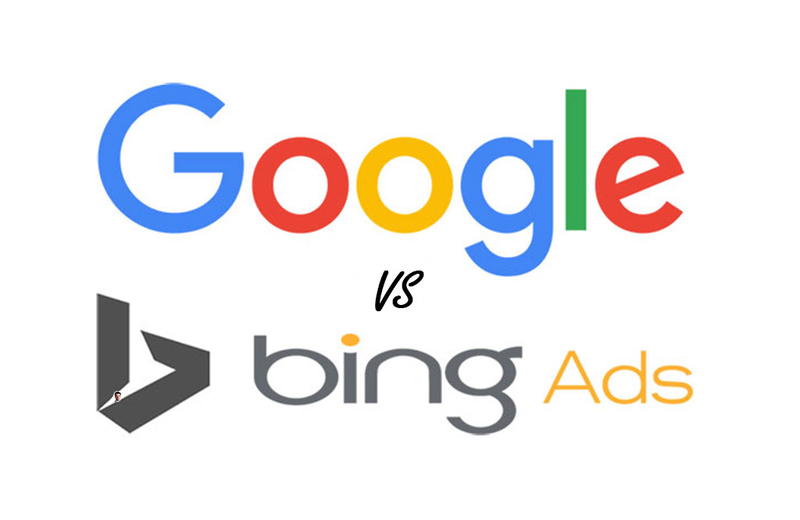 There’s no doubt that Google remains at the top of the funnel but with higher positioning, less competition and generally a lower CPC, what Bing lacks in volume, it certainly makes up for in performance and even fills some of the gaps that Google has. If you’re still unsure about the potential of Bing Ads, we suggest importing your existing Google Ads campaign into Bing (hint: double check your location targeting – sometimes Bing Ads has trouble matching some of the granular location targeting that Google Ads has, so instead will select the whole region) and putting a small amount of budget behind it to monitor how it performs for a few months. It’s important to note that each business and industry is different, and all will achieve different levels of success across both Bing and Google. Hopefully by now you have a better understanding of how and why you should leverage both of these platforms side by side. We’ve helped multiple businesses capture highly targeted traffic, qualified leads and increased their revenue by leveraging the power of both Google Ads and Bing. And we’d like to help you achieve great results from these platforms as well so that you can reach more of your ideal customers and have more happy prospects to sell to. If that sounds like something you’re interested in then contact us for a free consultation today and discover a brand-new approach to online advertising and marketing. Hayley is an innovative digital marketer with a keen interest in developing automated marketing strategies that dynamically respond to customer behaviour and help speed up the sales cycle.